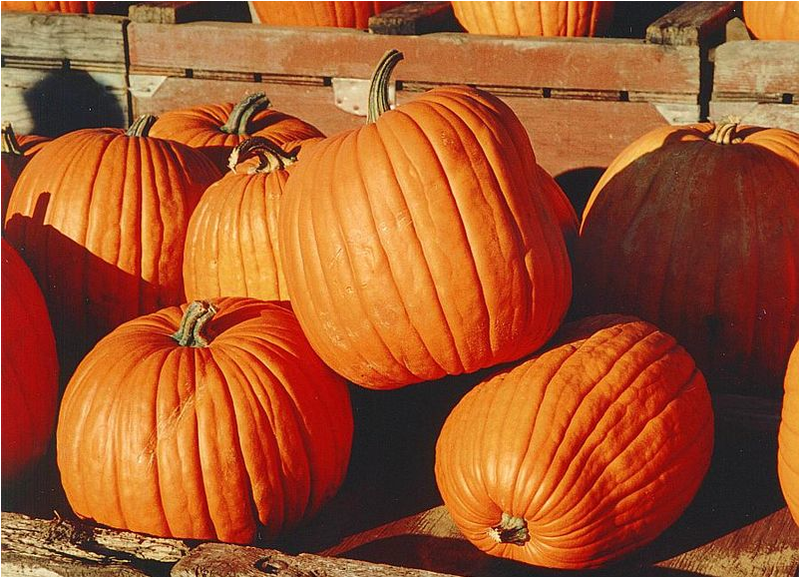 U.S. farmers grow more than 1.5 billion pounds of pumpkin each year. We know it’s fall when around September we start seeing glimpses of the orange globe known as the pumpkin. We know we’ve officially transitioned from the hot days of summer to the cool crisp fall weather. Pumpkins have been grown in the US for a very long time and is a staple for Halloween carvings and used for Thanksgiving pies. I was curious to learn more about this fruit so I found this information about the pumpkin… and yes the pumpkin is officially a fruit. I was not too surprised that pumpkins are a member of the gourd family, which includes cucumbers, honeydew melons, cantaloupe, watermelons and zucchini. These plants are native to Central America and Mexico, but now grow on six continents. In 1584, after French explorer Jacques Cartier explored the St. Lawrence region of North America, he reported finding “gros melons.” The name was translated into English as “pompions,” which has since evolved into the modern “pumpkin.” Pumpkins are low in calories, fat, and sodium and high in fiber. They are good sources of Vitamin A, Vitamin B, potassium, protein, and iron. The heaviest pumpkin weighed 1,810 lb 8 oz and was presented by Chris Stevens at the Stillwater Harvest Fest in Stillwater, Minnesota, in October 2010. Pumpkin seeds should be planted between the last week of May and the middle of June. They take between 90 and 120 days to grow and are picked in October when they are bright orange in color. Their seeds can be saved to grow new pumpkins the next year. Just some fun facts about the pumpkin we thought you like to know! Brought to you by Language Associates. Language Associates is a certified interpreting and translation company with over 30 years experience in 32 languages. For more information please contact us at languageassociates.net.